Our amazing eye contouring packages are split into 3 tiers – Silver, Gold and Platinum depending on the level of concern you have. All of these packages are perfect for men and women! 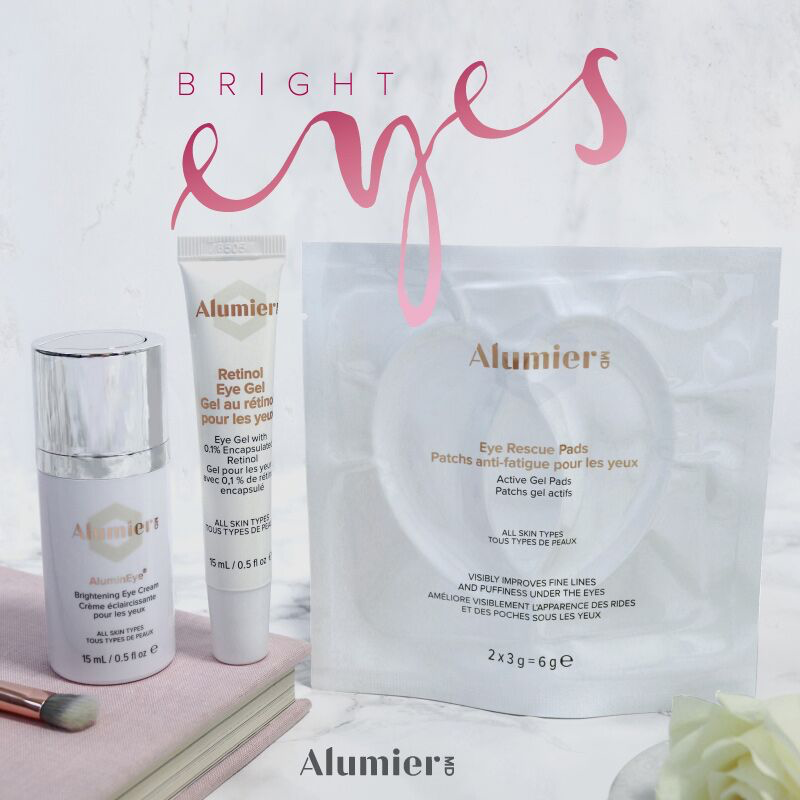 Purchase a Bright Eyes skincare gift bag for £99. Purchase a Bright Eyes skincare gift bag with 10% off. Purchase a Bright Eyes skincare gift bag half price. Our motto at SKIN lounge is to achieve optimum skin health, that lasts. To do this we believe that for most skin types that skin peels and light therapy are an amazing combination. WHAT – After your consultation, we will book you in for your first amazing treatment in this package – The Clearlift treatment. This treatment, famously known as the Hollywood Facial, is clinically proven to tighten and brighten your appearance by stimulating collagen in the deeper layers of the skin. WHY – This is fantastic for the area around the eyes as there is no abrasion to the surface or ‘down time’ with this laser. It will improve lines, wrinkles and can treat under the brow by using an acoustic sound wave to breakdown old collagen and remodel the new without causing surface damage. WHAT – The second treatment in these packages is the Venus Eye treatment. This medical grade anti-ageing treatment uses Radio Frequency to tighten the facial skin, contour and smooth lines and wrinkles. This works especially well around the eyes as it massively helps to de puff the under eye area whilst still being gentle to the upper layers of the skin. WHAT – HIFU is a revolutionary alternative to a surgical facelift. It is the deepest penetrating non surgical facelift on the market. We use only the latest generation machine – the Ultraformer III. HIFU targets deep down in the foundation layer of your skin, the same layer addressed in cosmetic surgery. Unlike lasers, which penetrate the skin from the outside in, the HIFU procedure bypasses the surface of the skin, and delivers targeted energy specifically into the deep, structural tissues and muscles where collagen lives. WHY – HIFU involves penetrating ultra-sound energy to stimulate collagen production in the deep dermal and sub dermal levels, which results in micro injury to that tissue. As the tissue heals, it increases collagen and as the collagen fibres organise and shorten, a tightening effect is seen on the skin. This is amazing for creating a natural yet noticeable brow lift. This treatment brings youth back to the eyes and can help with hooded eyelids and sagging skin. WHAT – iPixel is a fractional ablative laser that works by creating tiny squares of perforations in your skin, leaving the surrounding tissue intact, this allows for rapid healing and stimulates new collagen and elastin production, which improves the volume and texture of your skin, as well as minimising the appearance of fine lines and wrinkles. WHY – iPixel may be a little uncomfortable but the results are well worth it. As collagen remodels, scars begin to fade and your skin recovers its youthful radiance. iPixel can work on all aspects of skin ageing including pigmentation, sun damage and scarring. At SKIN lounge, we make sure we only sell the absolute best products which have been thoroughly clinically researched. Related products – With this particular package of skin brightening we would recommend the Annual Beauty Awards winner – Alumineye. A rich, anti-aging eye cream that significantly improves the appearance of dark circles, fine lines and puffiness in any skin type. Another fantastic product is the Retinol Eye Gel. An innovative microencapsulated anti-aging retinol eye gel that dramatically improves the appearance of fine lines and wrinkles and firms the skin. Recommended for all skin types. Read more about Eye health, skin tips and the only way to reverse eye ageing on our lounge blog written by one of our skin experts! We look forward to starting your amazing skin journey! Body remodelling and sculpting – How you can bag one free treatment in March!